Take your company’s email analysis to the next level by adding Drip as a Source to Segment. We’ll automatically collect email events like Email Delivered and Email Opened, forward them to your destinations, and load them into your data warehouse. In your favorite BI or analytics tool, you’ll be able to analyze your email campaigns in SQL or through drag-and-drop reports. And, you’ll be able to join your Drip data with the event data you’re already sending through Segment to analyze the down-funnel effects of your emails. Learn more about how you can use Drip with Segment. If you have previously enabled sending email events via the Drip destination during our beta (using a project write key), you do not need to create new Drip source. Your email data will continue to flow as normal. Give the Source a nickname and a schema name. The nickname will be used to designate the Source in the Segment interface, and the schema name is the namespace you’ll be querying against in your warehouse. You can name them however you’d like, but we recommend sticking to something that reflects the Source itself, like Drip for nickname and drip for the schema name. The next page (“Overview”) will surface your Segment write key for Drip. Copy this write key. To finish the setup, you’ll have to go into your Drip account and enter this Segment write key in their integrations settings. 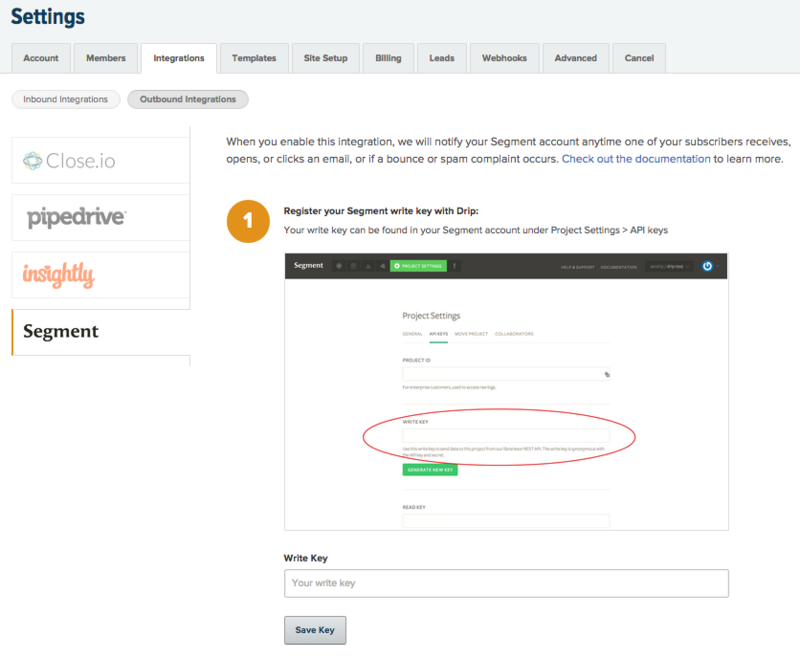 Find the right place in Drip by clicking Settings > Integrations > Segment. In Segment, click into your Drip Source in segment.com/<your-workspace>/sources. From there you’ll be able to add Destinations where you want to see email events. Drip uses our stream Source component to send Segment email events. It uses a server-side track method to send data to Segment. These events are then available in any destination that accepts server-side events, and available in a schema in your data warehouse, so you can query via SQL. The default behavior is for Drip to pass the userId associated with the email recipient as the userId. There are cases in which Drip does not have an associated userId, in which case the email address will be passed in as the anonymousId. The Drip Source works better when you also connect Drip as an destination. With the Drip Destination, you can use Segment to send Drip user and event data from which you trigger email campaigns. Want to start sending website or mobile data TO Drip? Head on over to our Drip destination docs.